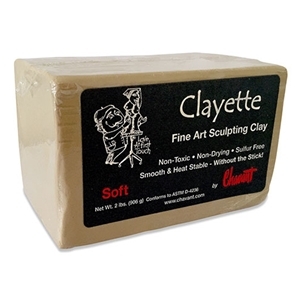 Home → → Chavant Clayette Fine Art Sculpting Clay - Soft - 2 lbs. Ready to use, Chavant's Clayette sculpting clay is a non-toxic, sulfur-free plasteline. It is non-drying, smooth and heat stable. Less sticky than Chavant's NSP Plasteline. Color - Tan. Packaged 2-lb. unit.